In February of 2006, R&H heard from our friends in Minnesota at the Chanhassen Dinner Theatre that they had recently opened a new musical revue, entitled MID-LIFE. Knowing that Chanhassen has a tradition of mounting popular and long running musicals (Danny Goggin premieres all of his NUNSENSE shows there and I DO!, I DO! ran for several decades), we were very interested to learn more about this new show, which had been written by the extraordinarily talented performers (and brothers), Jim and Bob Walton. CDT's stellar Resident Artistic Director Michael Brindisi took on the direction and tapped into the superb talent pool in the Twin Cities area, so it was a no-brainer that we had to check out this show. We went to a Friday night performance, and what a magical night it was! The theatre was completely sold out, the audience was beside themselves with glee, and we realized we'd rarely seen a happier crowd. They loved the humor, but also responded to the sweeter, warmer moments. Naturally, we knew that R&H was the perfect home for this crowd pleaser, and as we happily announced in the last issue of ""Happy Talk""--MID-LIFE! 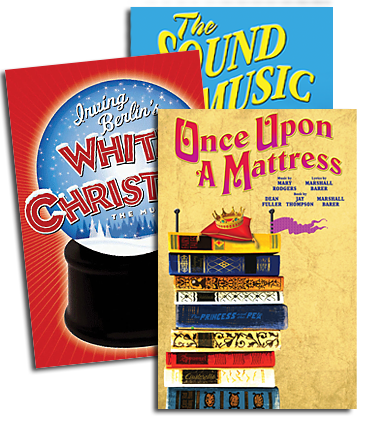 is now among the newest titles in the R&H Theatricals catalogue. As MID-LIFE! rapidly approaches its one-year anniversary at Chanhassen, we invited Michael Brindisi and theatre owner and Producer Tommy Scallen to talk about their hit show. R&H: How did you first become aware of MID-LIFE! THE CRISIS MUSICAL? Michael Brindisi: Jimmy Walton and I appeared with Sandy Duncan--an amazing performer!--in ANYTHING GOES at the Ordway Theatre in St. Paul. Jimmy and I became soul mates and spent a lot of time together. He told me about several projects he and his brother were working on, one of which was MID-LIFE! MB: Jim sent me the script and a demo CD. MB: It was hilarious! There was no doubt that this show would be a huge success on our stage. Tommy Scallen: It's true. We knew it had very strong sales potential from the start. R&H: And it seems to have met your expectations. TS: Oh, it has surpassed our sales goals and continues to be a strong seller. We've supported it with an occasional advertising campaign, but word-of-mouth has turned this show into a phenomenon. MB: And the audience response is ridiculous. Sometimes when I step in for a moment or two to watch, it sounds like a laugh track. There are many nights I open the theatre door to check on the show, hear this huge laugh, close the door and leave. R&H: Did MID-LIFE! surprise you in any way? MB: It surprised me that none of the material ever seems to shock. I think it's because it's so darn funny and, in the end, it's completely real. TS: I think, too, it has all the great humor you would to expect, but then there are a couple of poignant turns in the show that take you by surprise and you are actually touched by the tenderness of those moments. Then, of course, the humor rebounds and the laughter continues. It's a very real, a very honest look at what people experience during the mid-life years. R&H: Michael, how did the cast respond to the material? MB: They couldn't get through the first reading because they howled when they read their lines. Just before the holidays we added a Christmas encore that the Waltons wrote for us. It's called ""It's A Wonderful Mid-Life"" and we added it for performances between Thanksgiving and New Years. At first the cast was somewhat ambivalent about adding a new number. But when we started to put it together we had to stop several times because we were all laughing so hard. It's just the way the MID-LIFE! experience has been. R&H: Tommy, Chanhassen has had many long-running shows in its history and has more than a few long-time staff members. What has the staff response been to MID-LIFE!? TS: It definitely is a favorite with our staff. In fact, there have been many requests from employees for tickets. Unfortunately (or fortunately! ), the show sells so well there aren't always seats available for them. We said from the very beginning that this show had the potential to sell well for a very long time because of the built-in audience. Just about everyone in our audience is between 3570 years old and that number keeps increasing as people age. And of course, the subject matter is timeless. 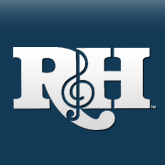 R&H: Has MID-LIFE! attracted a new audience demographic? TS: Yes it has. The audience skews a little younger and is less conservative. They order more cocktails and attend in larger parties of, say, four, six and eight, because it's a great show to see with a group of friends. The show is slightly edgier than the shows we typically do on our mainstage, and we're up-front about that in our advertising and over the telephone. So the people coming to see MID-LIFE! know it in advance and don't seem to mind, as Michael said before. MB: And both the young people and seniors seem to find mid-life issues to be very funny. It's weird, the kids like to laugh at it and the seniors seemed to be relieved to be through with it. R&H: What are you favorite parts of the show? MB: I have to say I'm attracted to the ""over-the-top"" material. ""Classical Menopause"" is a piece that would be impossible to explain, but is a must-see. Also I could watch ""Another Trip to the Doctor"" every night. Two guys in a waiting room before they're about to have a physical exam is a very funny song about what they don't mind and what they don't look forward to. Jim and Bob wondered if it went too far. I encouraged them to keep it in and it is a highlight people often comment about. TS: That's my favorite part, too, mainly because it's an experience that every male dreads and it puts it in an entirely fresh perspective. And the ladies love it, too. R&H: Tommy, is there anything tricky about producing MID-LIFE! that future licensees should be aware of? TS: The show is straight-forward and sells on the title itself. It's aimed directly at the boomers and it appeals to their new stage in life. It's a very, very good show and it will sustain a long, healthy run in almost any market. R&H: Did the MID-LIFE! experience teach you anything new about your operations at Chanhassen? MB: Don't be a snob about theatre that is primarily about having fun. That serves a purpose, too. R&H: Rate your experience with MID-LIFE! on a scale of 1 to 10, 10 being the best. MB: ""10"" for sure, and I mean that. The process was exceptional and the greatest reward is the consistent audience response. TS: ""9""--there's is no such thing as a ""10"". Hey, I'm a producer!